Why the Loss of US Manufacturing Jobs? We’re seeing hours of media discussions about loss of US Manufacturing jobs with few commentators discussing the facts. Washington continues to say that free trade with Mexico is hurting the US economy and siphoning off manufacturing jobs to Mexico at the expense of the US worker. But is this the whole story? What do the numbers actually show? 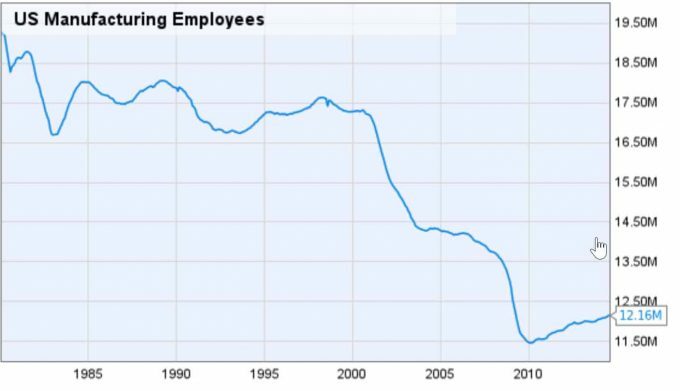 Manufacturing jobs in the US have certainly been on the decline for several years in the US. But are the North American Free Trade Agreement (NAFTA) and trade with Mexico to blame? According to government numbers, about 12.3 million US workers are employed in manufacturing jobs – fewer than one in ten workers or just 8% of the workforce. In 1960, that number was one in four or 24% of the workforce. Since 2000, the US has lost approximately 5 million manufacturing jobs, and Washington is quick to look to Mexico and NAFTA as the cause. But what Washington doesn’t seem to recall is that in the years following NAFTA prior to 2000, US Manufacturing jobs actually increased! Clearly there is more to the story than trade with Mexico. So what’s the answer? In 2001, a significant event revolutionized the manufacturing landscape in the US. China was admitted to the World Trade Organization (WTO). The year before had seen a slight decrease in US manufacturing jobs, but the real downturn occurred in 2001, when China – newly admitted to the WTO – became the production center for many US manufacturers in search of dramatically lower labor costs. China supplied those low wages thanks in part to China’s suppression of labor rights. The AFL-CIO estimated that heavy-handed policies by the Chinese government lowered manufacturing wages 47% to 86%. Additionally, China has been accused of currency manipulation and other trade-distorting practices that make Chinese exports more profitable. And due to the expanded trade deficit the US had with China after 2001, the US saw a rapid decline loss of US manufacturing jobs. But even this is not all there is to the story. Is Trade with Mexico and China to Blame? While the effect of China on US manufacturing jobs is undeniable, it may be tempting to conclude that trade with Mexico and China is collectively at fault for a loss of US manufacturing jobs. Perhaps Mexico should share the blame with China. But there are some who argue that manufacturing in the US is not actually in decline at all. On the contrary, economists like Dr. Walter Williams argue that it is growing! Dr. Williams has argued that, while both Trump and Clinton accused free trade of hurting US manufacturing while on the campaign trail, looking at all the numbers will show that US manufacturing output and productivity are actually increasing. Manufacturing job decline has actually been occurring steadily since 1960 – long before trade with Mexico or China was an issue. Yet during that same period, manufacturing output increased by 40% as the US turned to more mechanized and highly skilled manufacturing in new fields such as aerospace, technology, pharmaceuticals, and transportation equipment. Another economist, Dr. Daniel Griswold, has pointed out that it was free trade that made 40% growth in US manufacturing possible. Citing a recent study by the Center for Business and Economic Research at Ball State University, Griswold observed that 85% of the manufacturing job loss since 2000 was in fact due to increased productivity growth. An interesting twist has just been announced. Taxing Robots. Bill Gates has set forth an interesting proposition that if robots are taking away jobs, jobs that used to provide tax flows, there should be a tax on robots to replace this lost revenue. While it may be enticingly simple to assume that trade with Mexico is costing the US manufacturing jobs, the numbers portray a much more complex picture – one in which China is a larger factor than Mexico, and US manufacturing is actually becoming more profitable thanks to free trade. For further information on subjects such as this the reader is invited to visit our blog at https://www.tecma.com.